There was unprecedented and unfathomable risk to putting three men atop a monstrous new rocket for the first time and sending them all the way to the moon. Here's a look back at the Apollo 8 mission on its 50th anniversary. CAPE CANAVERAL, Fla. (AP) — Fifty years ago on Christmas Eve, a tumultuous year of assassinations, riots and war drew to a close in heroic and hopeful fashion with the three Apollo 8 astronauts reading from the Book of Genesis on live TV as they orbited the moon. To this day, that 1968 mission is considered to be NASA’s boldest and perhaps most dangerous undertaking. That first voyage by humans to another world set the stage for the still grander Apollo 11 moon landing seven months later. There was unprecedented and unfathomable risk to putting three men atop a monstrous new rocket for the first time and sending them all the way to the moon. The mission was whipped together in just four months in order to reach the moon by year’s end, before the Soviet Union. Lastly, there was the photo named “Earthrise,” showing our blue and white ball — humanity’s home — rising above the bleak, gray lunar landscape and 240,000 miles (386 million kilometers) in the distance. NASA Administrator Jim Bridenstine — who at age 43 missed Apollo — marvels over the gutsy decision in August that year to launch astronauts to the moon in four months’ time. He’s pushing for a return to the moon, but with real sustainability this next go-around. As that first moon shot neared, Borman’s wife, Susan, demanded to know the crew’s chances. A NASA director answered: 50-50. “My main concern in this whole flight was to get there ahead of the Russians and get home. That was a significant achievement in my eyes,” Borman explained at the Chicago launch of the book “Rocket Men” last spring. On Christmas Eve, the spaceship successfully slipped into orbit around the moon. Before bedtime, the first envoys to another world took turns reading the first 10 verses from Genesis. It had been left to Borman, before the flight, to find “something appropriate” to say for what was expected to be the biggest broadcast audience to date. “We all tried for quite a while to figure out something, and it all came up trite or foolish,” Borman recalled. Finally, the wife of a friend of a friend came up with the idea of Genesis. Back in Houston, meanwhile, a limousine driver knocked on Marilyn Lovell’s door and handed her a gift-wrapped mink stole with a card that read: “To Marilyn, Merry Christmas from the man in the moon.” Lovell bought the coat for his wife and arranged its fancy delivery before liftoff. It wasn’t until after the astronauts were back that the significance of their Earth pictures sank in. Anders snapped the iconic Earthrise photo during the crew’s fourth orbit of the moon, frantically switching from black-and-white to color film to capture the planet’s exquisite, fragile beauty. “We came to explore the moon and what we discovered was the Earth,” Anders is fond of saying. His Earthrise photo is a pillar of today’s environmental movement. It remains a legacy of Apollo and humanity’s achievement, said professor emeritus John Logsdon of George Washington University’s Space Policy Institute, forever underscoring the absence of political borders as seen from space. “Over 3 billion people, mountains, oceans, deserts, everything I ever knew was behind my thumb,” he recalled at a recent anniversary celebration at Washington’s National Cathedral. Astronaut-artist Nicole Stott said the golden anniversary provides an opportunity to reintroduce the world to Earthrise. She and three other former space travelers are holding a celebration at NASA’s Kennedy Space Center on Friday, 50 years to the day Apollo 8 launched. “That one image, I think, it just gives us the who and where we are in the universe so beautifully,” she said. 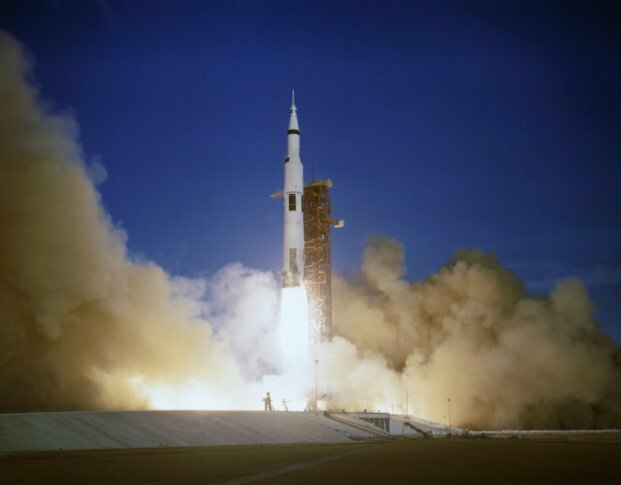 By July 1969, Apollo 8 was overshadowed by Apollo 11’s Neil Armstrong and Buzz Aldrin moon landing. But without Apollo 8, noted George Washington’s Logsdon, NASA likely would not have met President John F. Kennedy’s deadline of putting a man on the moon by the end of the decade. ___ AP video journalist Federica Narancio contributed to this report from Washington.